January 31 – February 2. Crews getting ready at the starting line. 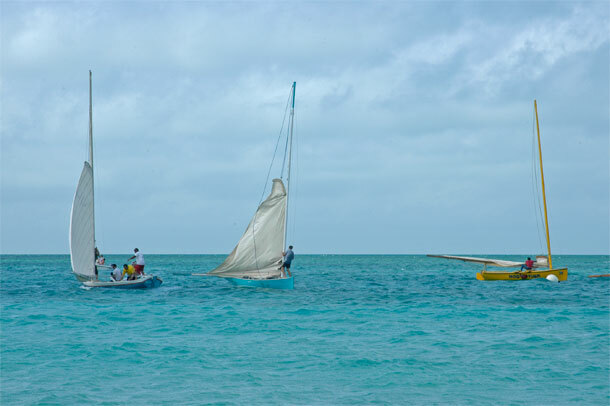 On the last day in January we sailed into the wind down to Little Farmer’s Cay. We wanted to be there for the First Friday in February Farmer’s Festival. The cold front that had brought tornadoes to Georgia was passing through. After we arrived the wind died completely. At night the clouds and strong winds from the northeast came. On the eastern side of Farmer’s most of the island’s shops are spread along the shores of two safe harbors. But on Friday afternoon we found that all the action was at Ty’s Sunset Grill by the airstrip that runs down the western side. 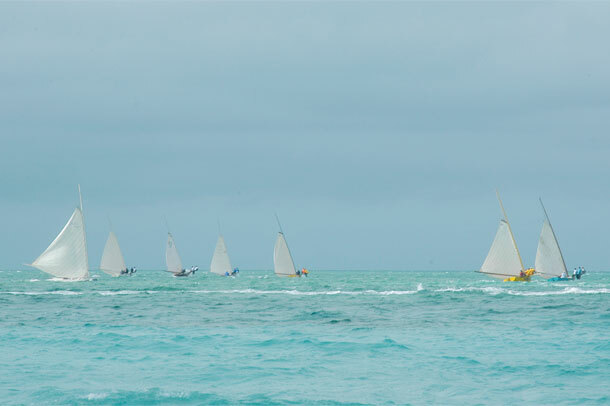 When we arrived there a crowd was gathering to watch the Class-C sailing race. 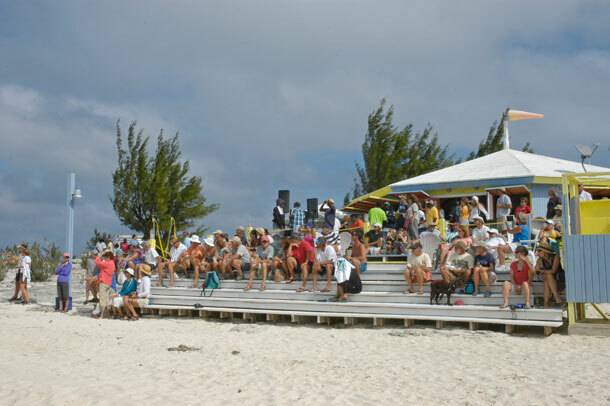 Bahamian music blared, drinks flowed, and the kitchen staff tried to keep up with food orders. The race was to start at 1PM, but you don’t see any clocks around here. We had time to swap tales with Eric and Gail of Viking’s Dream. And surprise! Sid and his dog Mr. Bojangles from Quest showed up. We thought they were in Georgetown. Sid has a new crewmate, Kate. She started the season with him, and they got along so well she stayed on. 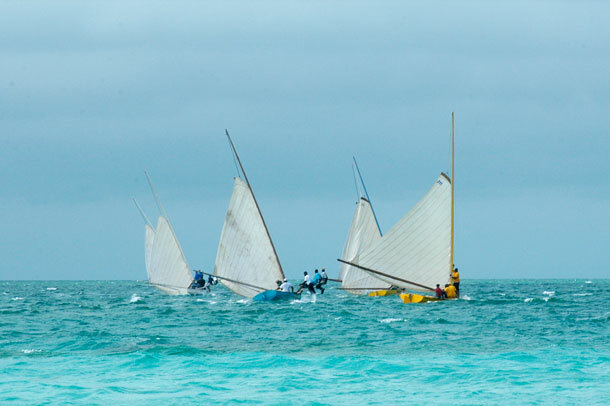 It looked way too windy for a race, but when the gun fired the crews leapt into action. 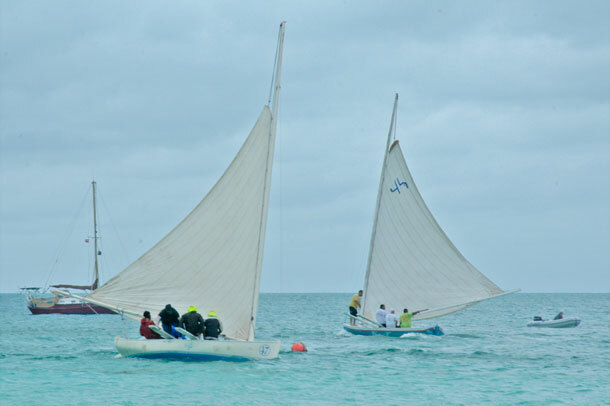 Sails were raised, tillers set, and crews slid boards into place and hiked out over the sides of their boats. These sleek boats with their long booms have low profiles. 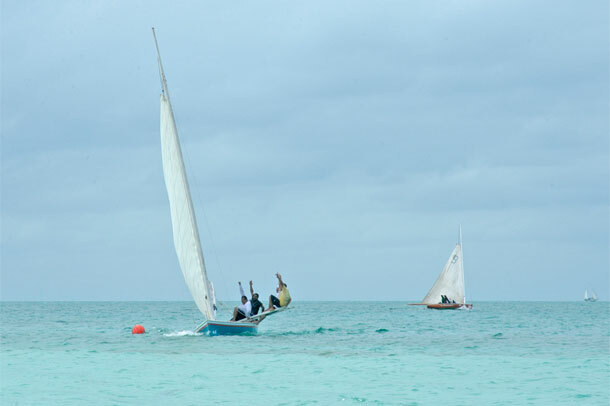 And in this choppy water, parts of the boats and their sails were often under water. It looked like a real struggle to stay on course. Whitty-X finished first, followed closely by some others. All boats eventually finished except one. A mast sticking up at an angle showed that this boat was lying on the bottom in 8 feet of water. The crew was safe. But they would have to dive down and remove the lead ballast weights, then bail out the boat. After the race we went the Farmer’s Cay Marina bar where Roosevelt, the owner, told us about life in the isle. Growing up, he was one of the young bucks who had to sail over to Great Guana for fresh pond water and be back in time for school. He also met his future wife here, but didn’t reel her in until they met again as adults in Nassau. The weather was getting nastier, but we walked to Little Harbor where we had spoken earlier with Sheena. We bought some of her delicious macaroni and a big helping of guanaduff desert. We also had another chat with J.R. who carves sculptures out of wild tamarind wood. Before leaving we dropped by Percentie’s Grocery and Liquor to see Frank and Debbie of Fat Chance. They are cruisers who spend a lot of time in these friendly parts. They know the owner well enough to give him the day off for FFFFF while Frank tends bar for him. Back on the boat we saw a couple of other boats move away from the airstrip area over to where we were. More and more boats moved until there was something of a crowd around us. Later we learned that they had been asked to move because they were too close to the runway approach. Pilots were tired of trying to thread between their masts. Saturday’s weather was much better. 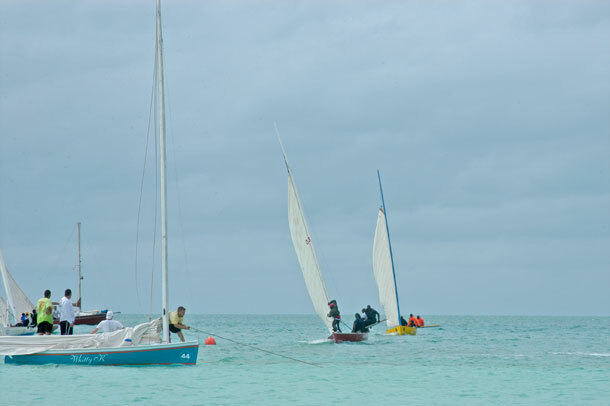 There were three sailing races with no casualties. Whitty-X was the overall winner. On our way over to Little Harbor we learned from a family of cruisers that we had missed the hermit crab race. Their young lad, who was carrying his hermit crab, was trying to keep a stiff upper lip. His crab came in last, being more interested in fighting than racing. Well, we could see that Roosevelt had spoken the truth yesterday. The FFFFF is a kind of homecoming for the young folks who live in Nassau now. They grey cursing crowd was slowly being replaced with a youthful hip hop fashion scene. Time to stock up on bottles of rum and head home. Starting gun fires. Raise anchor, raise sail! Boat in the foreground has just tacked around the bouy. 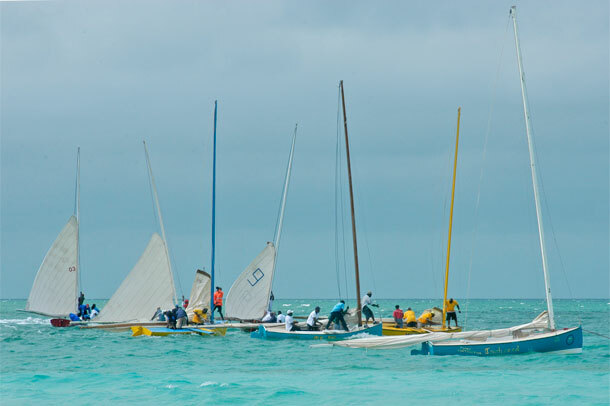 Competing crew readies to duck under the sail and hike out after tacking. 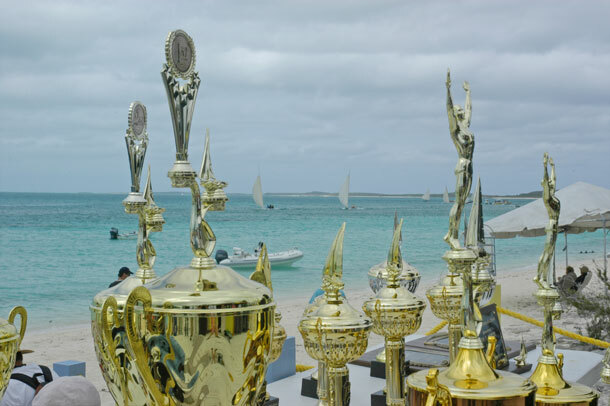 View of the trophies with racers in the background. 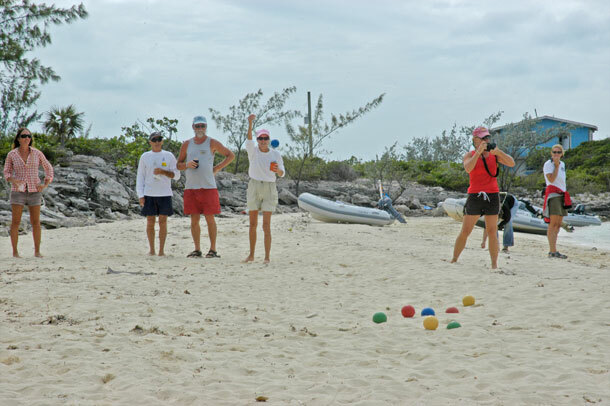 You can play a little beach bocce and still keep up with the race. Ty’s has a good setup for spectators. Winners cross the finish line. Whitty-X drops sail and anchors as 2nd and 3rd place finish.